It's no secret that Melbourne's inner northern suburbs boast higher-than-average densities of restaurants and Italians. Coincidence? I think not. But with pizza and pasta lording it over noodles and cous cous, what does an Italian restaurateur do to make their trattoria top of the list? Cafe Bedda's first point of difference is to raise the flag of a particular Italian region: the dishes and wines at this High St eatery are distinctly Sicilian. Secondly, its menu reveals neither a pizzeria with some OK pasta dishes, nor an exhaustive examination of Italian pasta and sauces with some mediocre pizzas on the back page. Bedda offers a reasonable selection of both. On two trips to Bedda, the seasonal specials have impressed. Tonight liver was on the menu as a main, but, tempting as it sounded, when one goes out for pizza there's an imperative to stick with pizza (rather like not ordering orange juice when you 'go out for coffee'). 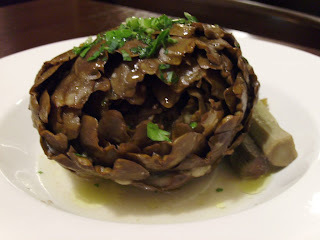 The carciofi entree special, however, was a suitable preamble: a whole artichoke stuffed with breadcrumbs, parmagiano and herbs, eaten rustic-style by plucking out the leaves and scraping off the nutty flesh with your teeth. Bedda's renowned pizzas are prepared amidships in a modern-looking, double-decker oven emitting a greenish glow from its halogen elements. While the chicory and lemon pizza features in most Bedda reviews, the pizza of choice tonight was the Otto: tomato, pancetta, caramelised onion, cayenne pepper, garlic, olives and parmagiano. Quite a list! 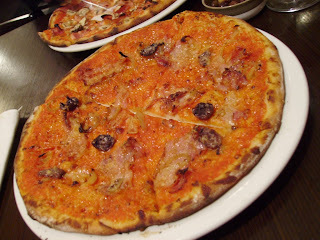 Regardless, the toppings were delicate enough for Bedda's super-thin crust to handle. Bedda's style is not to lay on the stringy cheese: the tomato base is far more crucial for holding the ingredients together and the parmagiano adds more tang than tension. Caramelised onion provided a wonderfully sweet offset to the salty pancetta. A rogue pepper seed cropped up on the last bite, turning what had been a pleasant spark of warmth to an unexpected fire. Time for another glass of nero d'avola to quench the heat! There's a lovely atmosphere to Cafe Bedda: the checked, tiled floor keeps things feeling busy, even when it's not full; while the dark wood furniture minimises the visual assault. It's big enough that large groups can be sat away from quieter couples, but small enough that several tables can watch the pizzaiolo in action. The density of Italian restaurants may be high in this area, but this one is better than average.